Bulldogs defeat neighboring North Marion Huskies 2-0 to claim their sixth state title in the past nine seasons. If it wasn't official at the beginning of the season, it is so now: The Woodburn boys soccer dynasty is back. 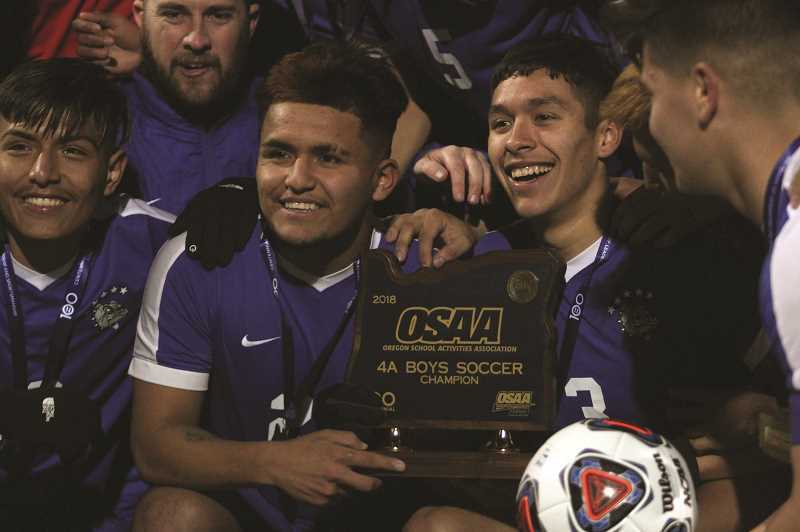 Nearly six years to the date after the Bulldogs celebrated their third straight state championship, Woodburn is once again reveling in a third consecutive title after defeating the North Marion Huskies 2-0 in the 2018 4A State Championship game at Liberty High School in Hillsboro on Saturday. "I couldn't ask for a better season to end," Woodburn senior Jesus Rodriguez said. "It's my last game as a high school player. It was beautiful." Rodriguez scored the final goal of the season for the Bulldogs, taking a pass from teammate Trevor Karsseboom in the 59th minute and drilling the back of the net past North Marion goalkeeper Colby Gianella to give Woodburn its final margin of victory. It was the coup de grâce for the Bulldogs, who had largely dictated control of the game. Woodburn dominated nearly every statistical category, controlling the time of possession and forcing the Huskies to put most of their energy into countering the Bulldogs' attack. Woodburn took 25 shots compared to just three for North Marion, all of which came in the second half. It took only four minutes for the Bulldogs to take the early lead when Edwin Silva's shot from the right side of the field was stopped by Gianella, only for the ball to pop out of his hands to a waiting Jimmy Martin, who knocked it in to give his team an early lead. For a Woodburn team dominated by its senior class, it was a special moment for an up-and-coming player who had carved out an important offensive role for himself with the team this season. 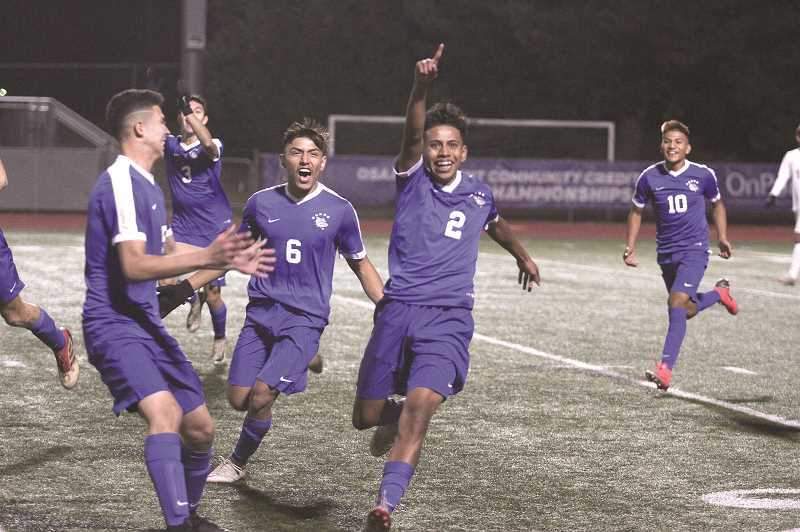 "He didn't score a single goal last year and then he scored the first goal against North Marion in the preseason and then scored the first goal here at the last leg," Woodburn head coach Leroy Sanchez said. "What an ending for him and the team." From there, Woodburn continued the onslaught, continuing to pressure the Huskies and keep the ball in North Marion territory. But the Huskies weathered the storm, driving back every advance by Woodburn to head into the half down 1-0. As the two teams rejoined the pitch for the final 40 minutes, North Marion came out strong, challenging the Bulldogs and successfully launching its own counterattacks, which generated its first scoring opportunity in the 52nd minute. But the chances were too far between, and Woodburn continued to apply pressure. Gianella kept the Huskies in the game denying a pair of shots by Silva, including a point-blank header off a corner kick in the 55th minute. Eventually Woodburn found its mark, countering a corner kick from North Marion when Karsseboom moved the ball up to a streaking Rodriguez for the final goal of the game. "We congratulate them," North Marion head coach Rafael Pelaez said. "We came at them with everything we have and everything we can. They are the champions." Gianella continued to play inspired ball in the net, finishing the game with nine saves to be named North Marion Player of the Game. Rodriguez, in turn, was honored as Woodburn's Player of the Game. "We knew we had the team to take it, but we just needed to keep continuously practicing," Woodburn defender Riley Menezes said. "You never know what can happen."